POSTED: Wed, 05/31/2017 - 16:00 | POSTED BY: Traci C.
Happy Wednesday! We have some news from Disney's Hollywood Studios today with a couple of briefs about Guardians of the Galaxy including a new Groot sipper cup at the Studios. Let's check out today's round-up. Last week several sites reported the debut of a new projection show at Disney's Hollywood Studios. The 'Disney Movie Magic' show debuted on the facade of the Chinese Theater prior to the nightly showing of Star Wars: A Galactic Spectacular. As construction continues on Toy Story Land at the Studios we're hearing reports that the track has been installed for the Slinky Dog Dash coaster. There's no official opening date yet for Toy Story Land, but we're expecting more information to be released at the D23 Expo in July. 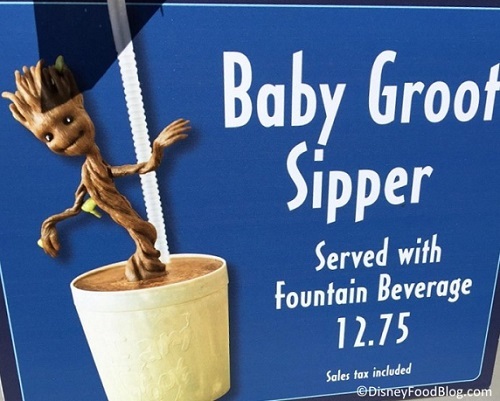 Fans of Guardians of the Galaxy will love the new Baby Groot sipper cup and cupcake available now at Disney's Hollywood Studios. And finally, Guardians of the Galaxy Vol. 2 beat the original film's box office numbers, grosing $785.3 million at the global box office so far.